Mary Jane in Marvel’s Spider-Man for the PlayStation 4. Mary Jane Watson is one of the most important players in Spider-Man’s expansive mythos, but in the five decades she’s been appearing in Marvel’s comics (and other properties based on them), her character’s never really been fleshed out in a way that made her feel like a three-dimensional person. That fact is what makes Mary Jane’s role in Insomniac’s new Spider-Man game for the PlayStation 4 so surprising and legitimately fascinating. In one fell swoop, Marvel’s Spider-Man transforms Mary Jane into a version of herself that feels both familiar and totally reimagined as a person with agency, drive, and an important part to play in a story that’s as much about her own origins as a hero as it is about Peter Parker’s. Even though Mary Jane technically made her comics debut in The Amazing Spider-Man #25 way back in 1965, you never actually saw her face until issue #42, a year later, when she was revealed on-panel. Before then, Mary Jane’s presence in Spider-Man was something of an ongoing joke, as Aunt May repeatedly attempted to set Peter up with her and Peter made a point of purposefully avoiding her. But when Peter eventually met MJ, he immediately fell head-over-heels in love with her. Peter Parker meeting Mary Jane for the first time. To put it simply, Mary Jane’s attractiveness was more or less the one thing that defined her in the earliest Spider-Man stories—she was the fiery redhead in Peter’s life who gave Gwen Stacy a run for her money. But as time went on, MJ never really grew as a character beyond that rather basic conceptualization. While Peter balanced his responsibilities as a student, nephew, and superhero, Mary Jane was simply the girl next door (and later girlfriend and wife) whose life was repeatedly endangered because of her proximity to Peter. Mary Jane struck out on her own to pursue careers as a model and actress (and most recently, as Tony Stark’s assistant) on a handful of occasions. But her solo endeavors never lasted particularly long and were undoubtedly eclipsed by the number of times she was stalked, attacked, and/or kidnapped—necessitating Peter to step in and save the day. There’s no real reason this ever needed to be the case, but one imagines it’s the result of her being written by men who don’t know how to write female characters as anything but damsels in distress. Mary Jane being stalked by her obsessive landlord, Jonathon Caesar. There’s nothing inherently wrong with the regular people within a superhero’s orbit leading comparatively pedestrian lives. But it’s always felt as if Mary Jane wasn’t being given her due—that Spider-Man comics, TV shows, and movies could and would be so much richer and more vibrant if Mary Jane had more to do than just wait around for Peter. Clearly, this idea also occurred to the people at Insomniac. 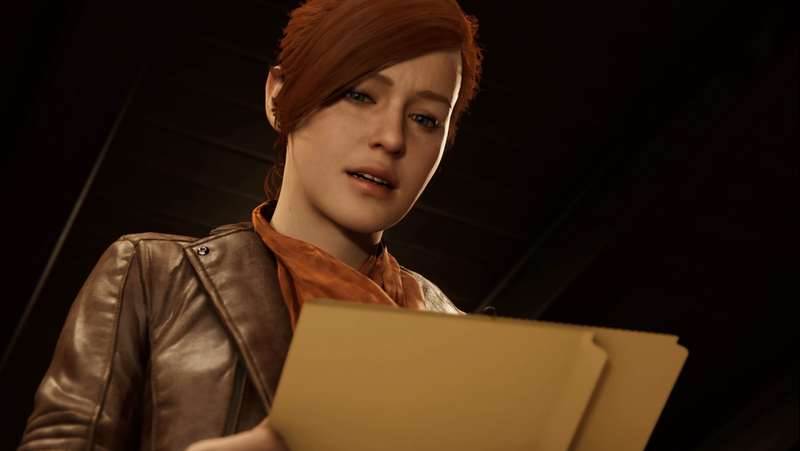 In Marvel’s Spider-Man, Mary Jane is still very romantically entangled with Peter, but that part of her life is put on the back burner in favor of a much more compelling narrative about her journey to becoming an investigative reporter. Though the game’s larger plot follows Peter taking down a number of his most iconic rogues, there are a few missions from Mary Jane’s perspective that focus on her fight to uncover the truth about many of New York City’s most powerful crime bosses. Rather than merely waiting for Spider-Man—or, worse, just hiding in a corner until all of the dangerous action is over—this incarnation of Mary Jane jumps into the fray herself by infiltrating a number of dangerous hideouts and securing valuable information she ultimately publishes in the Daily Bugle. The game never shies away from the fact that Peter and MJ have a history with one another, but it also makes it clear that she has a life, dreams, and ambitions that have absolutely nothing to do with him. Peter’s right to caution MJ away from sneaking into construction sites and buildings crawling with armed goons; after all, when her solo missions fail, they don’t hesitate to kill her. But when you successfully complete an MJ mission, her resolve and belief in her ability to get things done on her own are affirmed in a way that’s incredibly satisfying. The superhero and reporter/significant other dynamic isn’t at all new, but the way the game frames Mary Jane and Spider-Man is distinct from, say, Superman and Lois Lane’s relationship, because of the general grounded nature of Spider-Man’s adventures. MJ explaining what she’s doing in Wilson Fisk’s private gallery during a break-in. More often than not, Spider-Man’s taking on the kinds of street-level crime bosses whose greatest fears are being exposed to the public as the villains they are. Spider-Man might be able to take them out physically, but it’s Mary Jane’s skills and access as a reporter that ultimately hurt them in lasting, meaningful ways. At multiple points in the game, MJ asserts that she wants to work with Peter (who she knows is Spider-Man) as partners—and even though he’s slow to realize just what she means, it’s more than obvious that she’s entirely right to insist upon it. By the time Mary Jane is equipped with a device designed to distract people and a high-powered stun gun, she becomes a stealthy hero in her own right, taking down Sable agents with ease and confounding Martin Li’s Inner Demons gang. Imperiled though she is, she’s not a victim, or a damsel, or merely a reason for Peter to swing into action. She’s a reporter working to shed light on the truth and make a name for herself in the industry. She’s a version of Mary Jane Watson who’s been largely missing from Marvel’s comics for far too long. Hopefully, that’s something that’ll change in the not-too-distant future.